GO! Experience Design is a leading event marketing agency that enables Fortune 500 companies to bring their messages to life through the creation of unique experiences that range from live events to digital activations. eCity first partnered with GO! 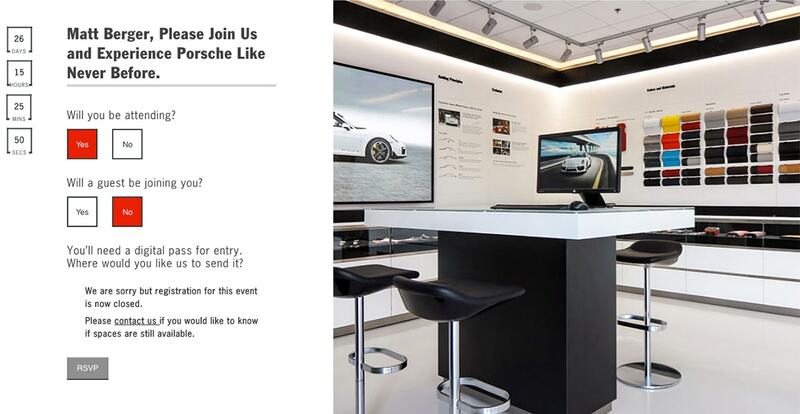 in 2015 to promote the launch of Porsche’s new flagship building in Atlanta, Georgia, and teamed up again in 2016 to celebrate the grand opening of the new Porsche Experience Center in Los Angeles. 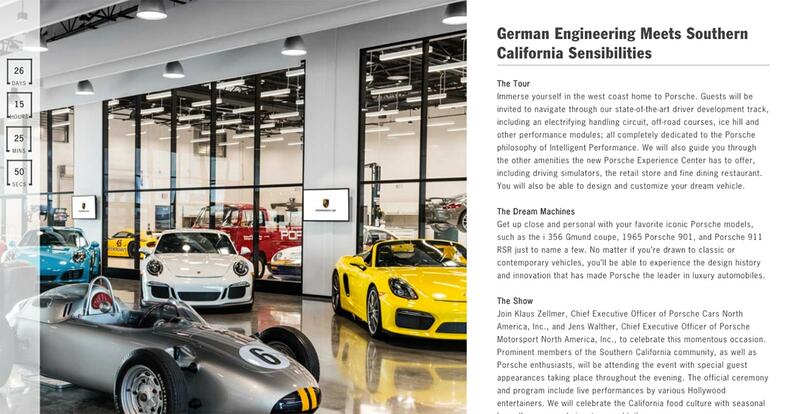 With the building and launch of its new experience center in Los Angeles, Porsche planned a grand opening to showcase the new home of Porsche Motorsport North America. The event was very exclusive, including an official opening ceremony with prominent businessmen and celebrities in attendance. 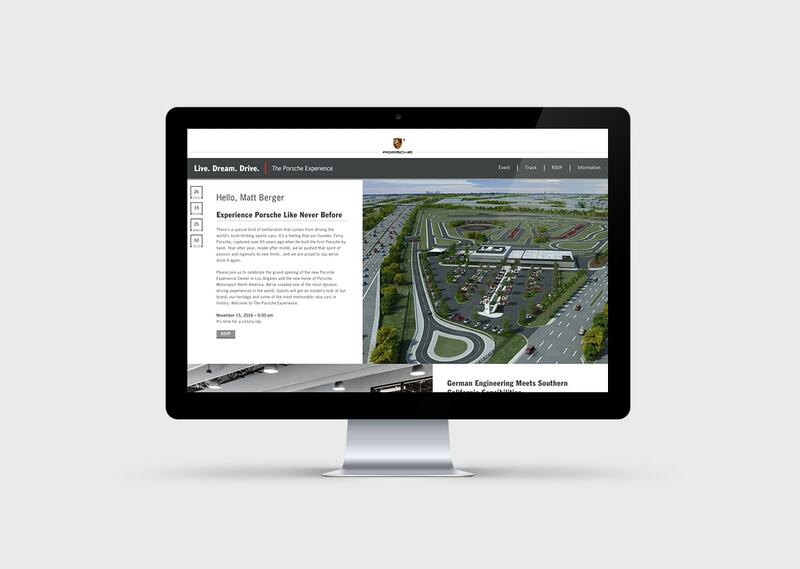 eCity was enlisted to build a secure event website that could support the needs of the event while communicating the high-end, sophisticated feel that would be in line with the Porsche brand. 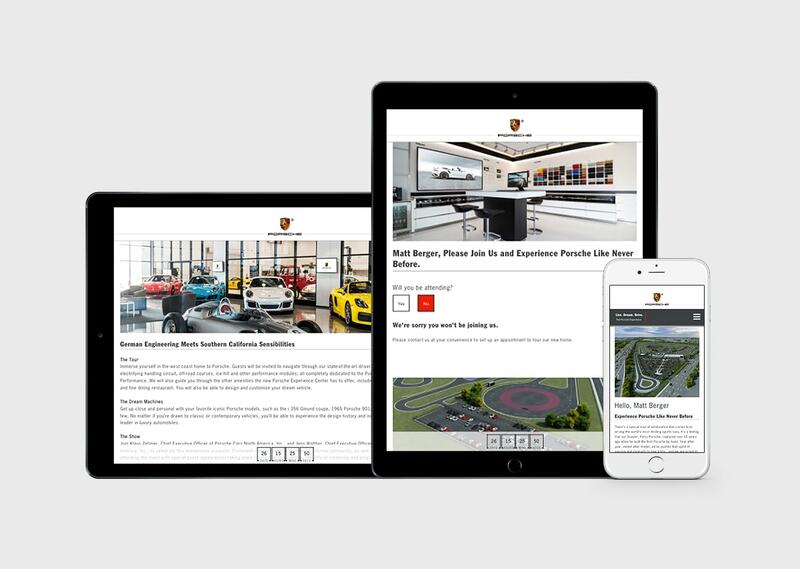 After extensive interviews and discussions with the client, we recommended a solution that would meet the informational and operational needs of running the event, as well as suggested some additional functionality, such an interactive course map, that would add some “flash and sizzle” that guests would expect from a Porsche-related website. The site set the tone of the evening and generated excitement with the attendees prior to their arrival. The site also allowed invitees a place to RSVP and receive a ticket. Additionally, the back-end was used onsite at the event to provide seamless confirmation and registration of guests upon their arrival.